When you look in your rearview mirror and see smoke coming from your exhaust pipe, alarm bells might start going off in your head. Car owners are trained to anticipate the worst when their car starts smoking; however, while smoke coming from your exhaust pipe can be a bad sign, that’s not always the case. To tackle this issue, it’s best to cover the different kinds of “smoke signals” your car may be sending you. We can do this rather easily by splitting up the issue according to the color/types of smoke coming from your exhaust pipe. No matter what, it’s wise to consult a professional if there’s smoke coming from your exhaust pipe (regardless of the smoke’s color). What causes white smoke to come out of the exhaust? This question is one of the most frequent ones we receive with regard to smoke coming from an exhaust pipe. There is a wide variety of potential answers (some of which are more upsetting to your wallet than others). 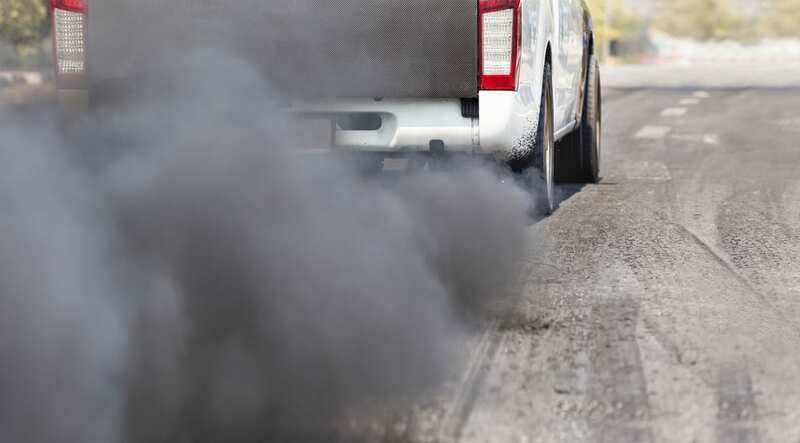 If the smoke coming from your exhaust pipe is thin, white smoke, you may be in luck. White smoke from your exhaust emitted on startup is very normal, especially if you live in a cold climate. The smoke is actually water vapor that’s formed when condensation builds up in your car’s exhaust system. This smoke should go away a few minutes after you start your car. Your car’s head gasket forms the connection between two integral parts of your engine: the engine block and the cylinder head. If the head gasket is damaged, it’s possible for coolant to make its way into the combustion chamber. This type of coolant leak creates thick, white smoke. Repair/replacement of a busted head gasket is costly and should be taken care of ASAP. The cylinder head houses the combustion chamber, which plays an integral role in getting your engine to fire up. In other words, the cylinder head is a volatile area in your car, and white smoke coming from your exhaust pipe that’s caused by a damaged cylinder head (again, caused by burning coolant) can spell a big repair bill. Depending on the age of your car, you may want to consider purchasing a new vehicle instead of replacing the cylinder head. If you have white smoke coming from your exhaust pipe due to worn piston rings, failed valve seals, or even a cracked engine block, it’s time to consider more extensive repairs. Worn piston rings or a cracked engine block indicate that the integrity of your engine is compromised and that your engine is almost certainly in need of rebuilding or replacement. Replacing the entire engine is an expensive investment, which is why some people opt to get a new car. Depending on the age of your vehicle and your budget, you can choose to either replace the parts causing the leak — likely the piston rings or valve guide seals — or simply top off your oil frequently. However, burning oil does harm the environment and will wear out your car’s spark plugs over time, both of which create their own costs. Whether you use your car to putter around town or you’re looking into things to check on your car before a long trip, it’s highly recommended to take your car into the shop when smoke starts coming from your exhaust pipe. The mechanics at Colony One Auto Repair are experts at making sense of your car’s smoke signals, auto exhaust system repair, and much more. Put your vehicle’s longevity in the hands of some of the best mechanics in the greater Houston area. Call Colony One Auto at 281-864-1697 or contact us online today. Will my Car Pass an Inspection with the Airbag Light on?